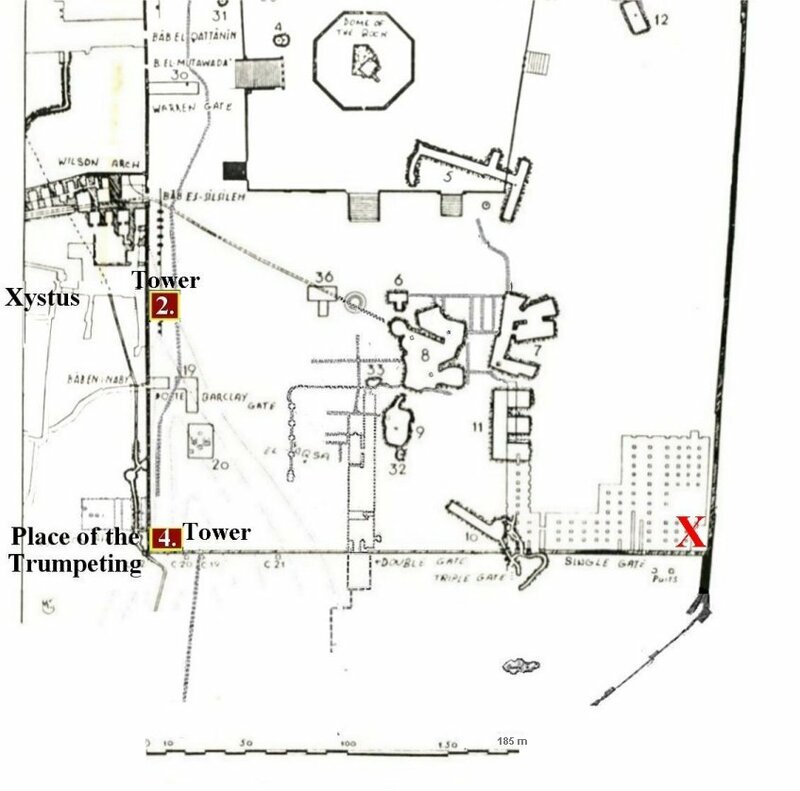 The “Place of the Trumpeting” and the place above the Xystus reveal the real location of the Temple. It seems that the location of the Temple has always been hidden in plain sight in the works of Josephus. Amazing! We learn of the Place of the Trumpeting through Josephus as he describes the towers built by the Jewish Rebels who had taken over the city prior to its destruction. The rebels split into two groups and began warring against each other. One faction held the Temple and they built towers on the corners of the Temple compound to get a higher advantage for their arrows. One of those towers was built above the Xystus. So first we need to find out where that was. "Now that wall began on the north, at the tower called "Hippicus," and extended as far as the "Xistus," a place so called, and then, joining to the council-house, ended at the west cloister of the temple." The Xystus was a plaza used for assembly, to hear public speeches made from the west wall of the Temple Mount. The ruins of the Council House were discovered by Charles Warren in the 1860′s. 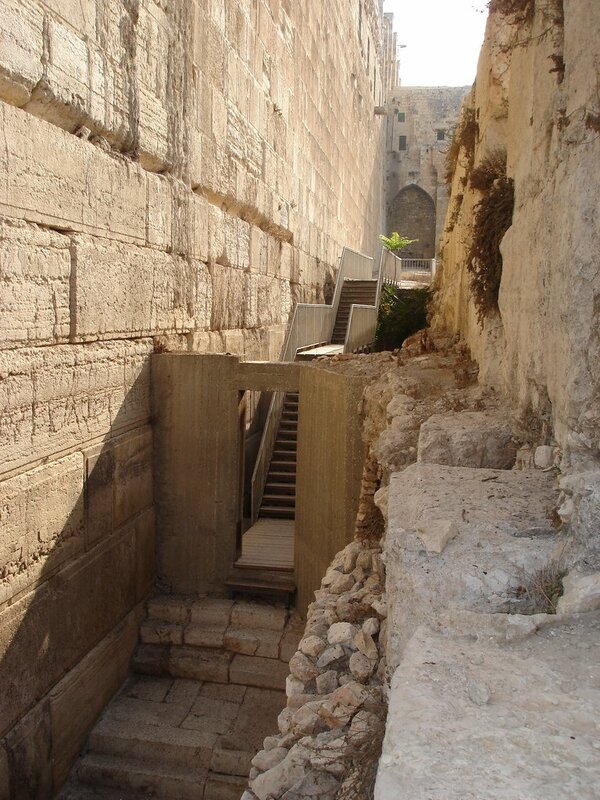 It is located near the Western Wall and the bridge over Wilson’s Arch. 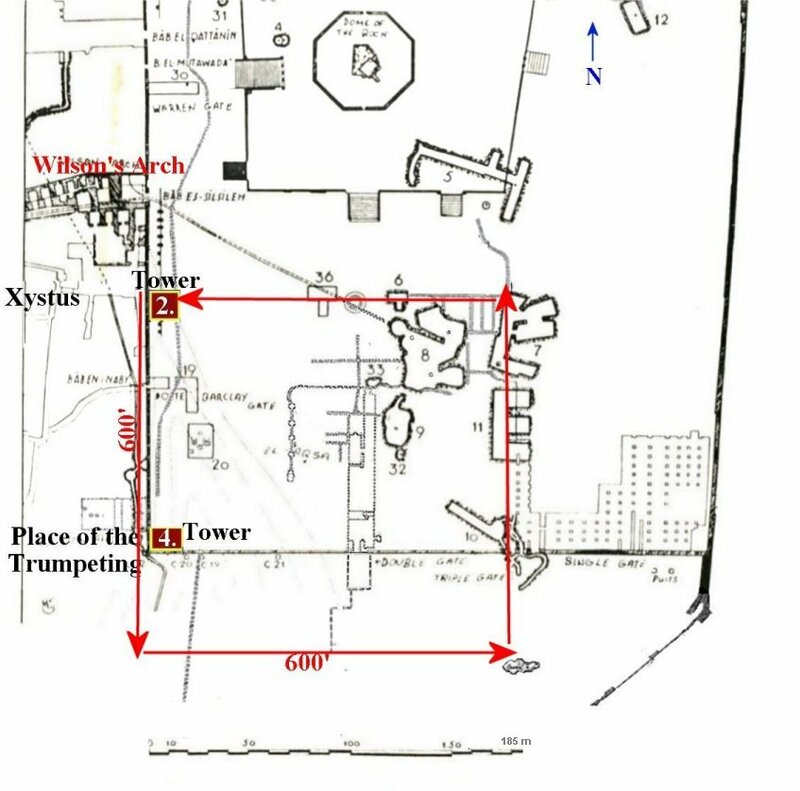 The Place of the Trumpeting was located at what is now thought to be the southwest corner of the Temple Mount. At the base of the southwest corner the remains of “The Place of the Trumpeting” stone was found. It lay where it had landed after the destruction of the Temple. This graphic shows two of the towers. Numbers 2 and 4. 1.The first tower was built at the northeast corner of the Temple compound. 2.The second on the corner of the Temple, across from the Xystus plaza. Placing the towers on Warren’s map helps us to get our bearings. It is most important to remember that the towers were built on corners of the Temple. 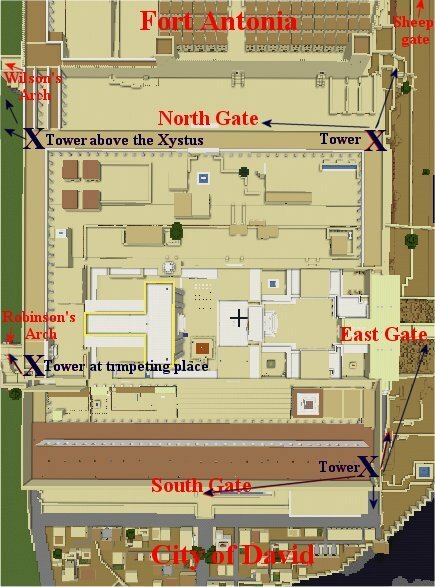 This means that the tower built above the Xystus was built at a corner of the temple. As we can see there is no longer a corner in that place. But if there were it would be built at what used to be the northwest corner of Herod’s 600 x 600 foot Temple. 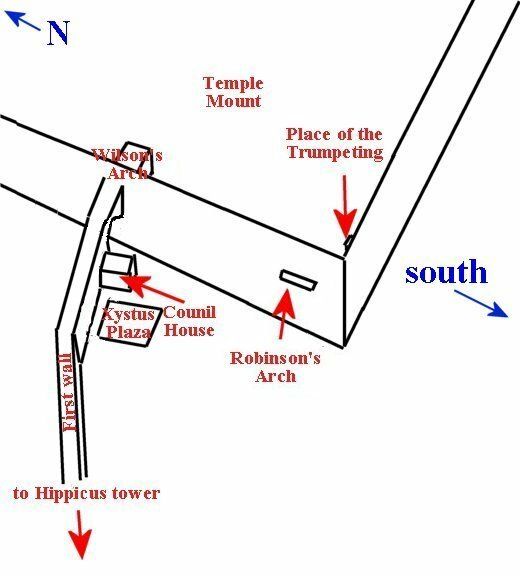 To know where the temple was actually located on the Temple Mount we must combine this with what Josephus said about the size of Herod's Temple. It was a furlong in length and a furlong in width. 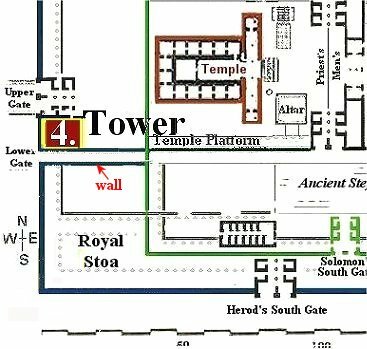 So all we need to do is start at the tower built on the northwest corner above the Xystus of Herod’s Temple and measure a furlong of 600 feet southward. That gives us the southwest corner of Herod’s Temple. Then measure 600 feet towards the east and that gives us the southeast corner. Then measure north to find the northeast corner of Herod’s Temple where Josephus wrote that the first tower was built. It wasn't until the Place of the Trumpeting stone was found that the puzzle could be put together, but I didn't use the Trumpeting Place to show the location. Instead I used scripture, ancient survey maps, pictures of the Mount and Ophel, the writings of Josephus and the Jewish writings, such as the Mishnah, etc. to discover this location. 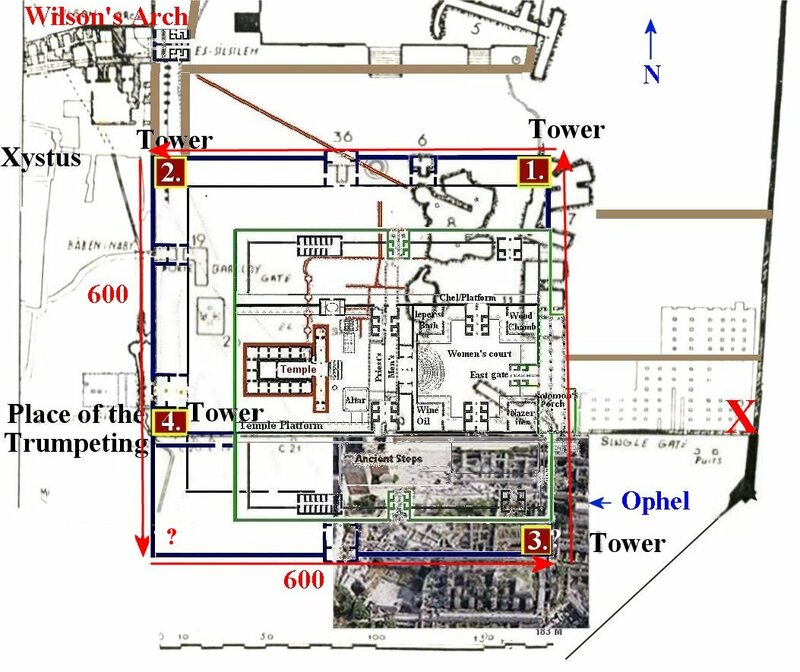 This graphic shows my Temple diagram laid over the map with the towers. With the towers built on these corners they were able to protect all of the entrances to the temple. In this theory there is a lower southern court. The lower Herodian extended court, which was the last court to be built, had a gate in the middle. This gate would have entered into the lower Herodian court and Herod’s Royal Stoa. The red arrow shows another wall built along side the South wall of the Mount in the above photo. Josephus wrote in war of the Jews 5; 5.2 that the bedrock was at it's lowest at this point at the southwest corner. From bedrock to the top of the wall was 300 cubits (437 feet). and then it was filled in to make it level with the streets of the city. 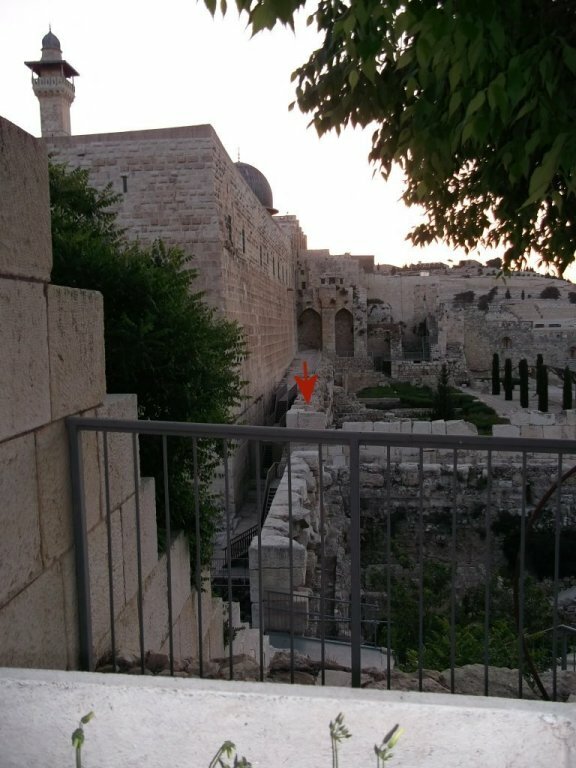 Is the southwest corner of the Temple Mount 437 feet from the top of what would have been a gate at Robinson's arch down to where they found the Jewish mikveh under the wall? I believe it is around 125 feet . Not even close to 437 feet as Josephus records it. This is in no way the southwest corner Josephus was speaking of. The southwest corner would have been further down Ophel hill where the depth was greater. Not only would the wall appearing above the street have to reach the level of the rest of the temple, much taller than any other wall of the temple...but the buried part of the wall below the street would also have to go down much deeper in order to reach the bedrock in the Tyropoeon valley at the place I propose for the southwest corner. 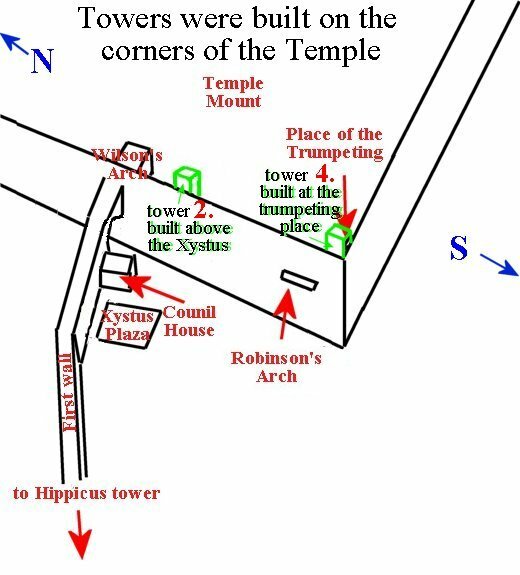 The only way this is possible is if the northwest corner of the Temple were at the place above the xystus pre destruction and of course pre Hadrian's reshaping of the temple mount area. This Temple theory is the only one which can account for all 4 towers in their proper places. 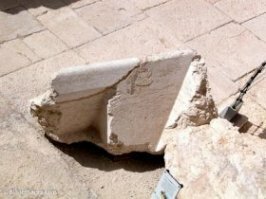 This is positive proof that the Temple was once located on the Temple Mount and not in the City of David or the Dome of the Rock. New! 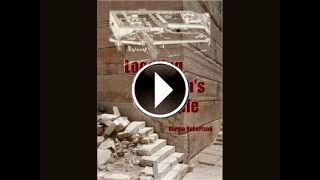 "Locating Solomon's Temple" now on Video!